This is a hearty but delicate tasting dish using plenty of fish. 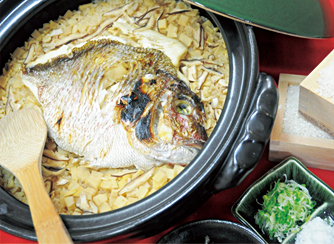 Enjoy the savory smell and deep flavors of our original tai meshi. This is a perfect dish for your special occasion. 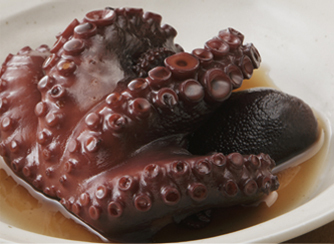 We carefully select only locally caught octopus and slowly cook them. They are tender and great flavored, so loved by all ages. This is one of our specialties to take out. 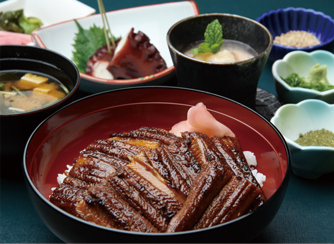 Chita peninsula is so famous for this Anago-dish that lots of Anago restaurants can be seen side-by-side. We recommend you try ours if you visit during the season: A bowl of rice topped with grilled conger eel coated with original sweet and savory sauce. Anago has less fat than other eels so it is healthy and loved by many women. 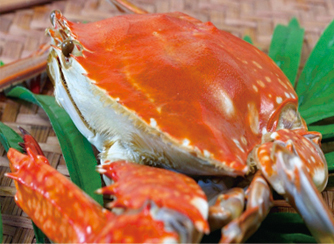 This is a gourmet favorite and local specialty, watarigani crab. Although the prices tend to vary depending on the catch, we offer relatively stable price during the season (see above). Some guests visit us especially for our delicious crab dishes. Awabi has been known to be good for the eyes. 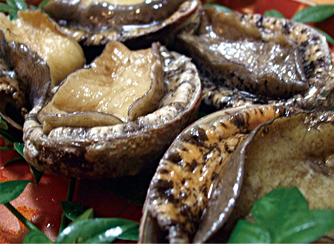 It’s also a well-known tradition for women to eat it during pregnancy and make wish to give their baby beautiful eyes. 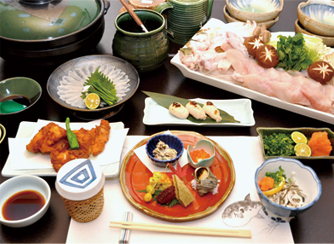 We offer exquisite awabi dishes such as grilled or sashimi at reasonable prices. We always have the chef’s sashimi special available, made with the finest ingredient using locally sourced fish. Enjoying real fresh sashimi is what you must do here. 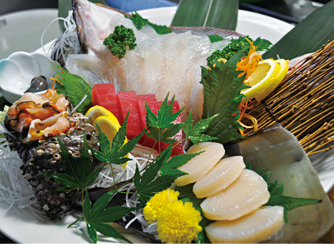 We can prepare sashimi boat-platters with assorted seafood from popular white fish such as sea bream, flounder to locally caught fish and shellfish based on your request. Ise-ebi is probably the most renowned Japanese lobster. 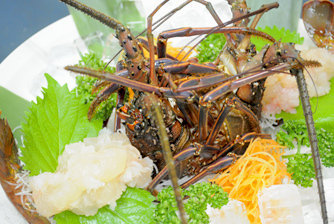 Super fresh Ise-ebi is available, prepared how you like it – whole Ise-ebi sashimi or, grilled with special sauce.